Switzerland: A Safe Haven No More? Anyone who has been following the currency markets recently has probably noticed that the Swiss franc (CHF) has been appreciated against the Euro at a pretty sustained pace. Specifically, check out the following chart from Xorte.com. 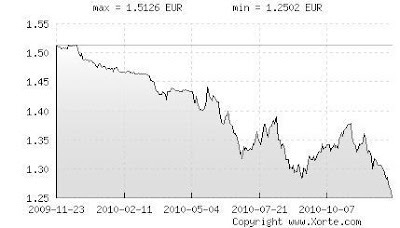 What it shows is that since last year at this time the EUR/CHF ratio has fallen from about 1.5 to 1.25, a 16.7% drop. Ostensibly, the appreciation of the CHF versus the Euro has to do with investors’ perceptions of the strength of the Swiss economy relative to that of the Euro Zone as a whole. Switzerland has certainly for a long time been associated with financial stability and conservatism. Additionally, Swiss banks have traditionally been viewed as a safe haven in an uncertain banking world. But is this still true today? What would happen if the Swiss government was forced to bail out its banks again? Does it have the resources? What would be the impact on the country’s bonds? The reason I began to think about these issues is that I was contacted by a wealthy friend and mentor of mine who owns a very large real estate company. After years of hard work, he is now concerned about US dollar-denominated assets and has invested some of his wealth into Swiss bonds and the Swiss franc. He also owns some physical gold that is held at a Swiss bank. When we started to talk about the issues that the Euro Zone faced, he asked me if he should be worried about his gold and his Swiss bonds. While I am inclined to think that his assets are safe, I do believe that the recent troubles with the European banks have caused the number of potential economic and fiscal outcomes to increase. So, while I am certainly not an expert on Europe, currencies or sovereign debt, it is not hard to justify being a little concerned about Swiss bonds and Swiss banks if some admittedly unlikely, but certainly possible scenarios actually play out. government debt. Although, I would make the argument that the country should do everything it can to avoid maintaining anywhere near the debt to GDP levels of the US, Greece and Japan. Now, $25.5 billion may sound like a lot, but it is nothing in comparison to the exposure of the UK banks. Specifically, the UK banks owned about $360.5 billion in PIIGS’s debt as of June 2010. 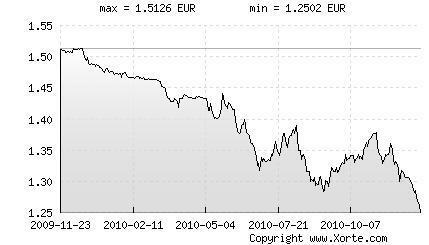 This figure represents an astounding 16.6% of UK GDP that amounted to $2.175 trillion in 20094. Let’s all hope that the UK never has to bail out its entire banking system by borrowing money from investors and thus placing the burden of the private sector on taxpayers. With government debt to GDP projected to be 76.7% in 20101, the UK may not have the capacity to add much more debt before interest rates spike and investors begin to get nervous. 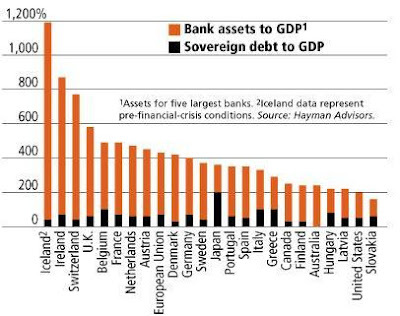 It shows that Switzerland had the 3rd highest bank assets to GDP ratio (only behind that of Ireland and Iceland!). Just eyeballing the chart indicates that the banks’ assets represent somewhere near 750% of the country’s GDP. So, if the banks were ever forced to write down more assets (sovereign debt, real estate loans, securities tied to the US housing market) they might subsequently have to be bailed as a result of their consistent inability to avoid bad assets. Given the worldwide aversion to letting bondholders lose penny, a bailout would likely require a ton of government borrowing that could represent a large portion of GDP. If the borrowing got to be too high (Reinhart and Rogoff suggest that the debt to GDP tipping point is around 90%) then the ultimate ability of the Swiss to repay their debt might come into question, an event that would certainly not be good for Swiss bonds. The other thing investors need to think about the security and liquidity of physical gold held at the once impenetrable Swiss banks. I have heard some (admittedly anecdotal) stories recently from gold bugs James Turk of Goldmoney.com6 and Jim Rickards of Omnis7 that indicate that people who thought they had allocated gold holdings in Swiss banks have not been able to get their gold in a timely manner. The implication is that the banks either lent out or sold the gold but still continued to charge the storage fee. Aside from potentially being fraudulent behavior, these stories highlight the dangers of depending on the banks to act in the best interest of their customers. Accordingly, I think that it makes sense for all investors to look at their arrangements with the banks and see if they have the ability to lend or sell your gold, a situation that essentially leads the bank to be short gold. In a rising price, high demand environment banks might not have the ability to locate an ample supply of physical gold. At that point owners wouldn't have the protection they wanted. As such, the recommendation from the gold bugs referenced above is to hold gold outside the banking system with a company like Brink's. For people who still look at Switzerland as a safe haven and a suitable place to park assets, I don't exactly know what the takeaway of the information presented above should be. I guess I just want people to be aware of the downside risks. I think that it is very unlikely that Swiss bonds will be not be paid in full. While a rising interest rate environment could lead to mark to market losses on recently purchased bonds, as long as they are held to maturity investors are still likely to get their full principal back. Furthermore, I think that there is only a remote chance that investors would not eventually be able to get their gold if they wanted it. However, as the price rises and physical supply gets tighter, there is always the risk that it might take longer than anticipated to obtain physical gold. This is always the problem with gold. It is a store of value, but it is not free to store and it is very difficult to transport and protect. Gold bulls always say that there is no counterparty risk with gold. That is true if you own your own vault. But, in the case of an investor who holds his or her gold with a bank, there is always the risk that the bank will not be able to live up to its end of the bargain. At that point, an investor might have to wait years to receive just compensation for the breach of contract and by that time the benefits he or she hoped to accrue from gold ownership may no longer be applicable. I know we all have plenty to worry about right now but I want to caution everyone from getting lulled to sleep to by the apparent security and long history of stability of Switzerland. Just like Iceland and Ireland, it has let it banks get to be far too large relative to the size of the economy. It is probably true that if the global economy improves and the contagion in Europe never fully materializes, Switzerland is a smart place to shift dollar-based assets to. However, if there are any bumps in the road, the extremely high bank asset to GDP ratio represents a type of leverage that makes the whole financial system unstable. The sad thing is that I don't know where to find a true safe haven right now. I wish I did. Therefore, if I were very wealthy and running my own fund I would buy some catastrophe insurance. There are two ways to think about such insurance. The first is as a hedge against risks that individual investors are exposed to. My friend owns a large commercial real estate company so buying out of the money puts on publicly traded REITs could be a decent hedge against price and rental declines in the real estate markets. Second, investors can identify situations in the world that seem unlikely to remain static. For instance, given Japan’s projected 2010 government debt to GDP ratio of 225.5%, it is shocking to see that the 10 year JGB only yields 1.2%10. With a declining population, an interest expense that continues to make up a large percentage of revenue, and a strong Yen that is killing exports, at some point investors are going to start to get nervous that the Japanese may not even have the capacity to repay their debts. If the world recovers and sovereign debt issues disappear, then by investing in some of the above hedges all that would be lost is what amounted to an insurance premium. With the S&P VIX as low as it is (look at this amazing chart of the roller coaster ride that is the VIX9) and clear over-optimism about the situations in the Euro Zone and Japan, some of these hedges might not even be that expensive. But, if we go back into financial crisis then investors have the opportunity to make multiples of their premiums and thus offset losses in other arenas. The point is that the perfect time to protect assets and initiate hedges is precisely when other people are dismissive of risk. This is one case in which waiting for more information or for another shoe to drop could be very costly. The US financial discourse over the past few months has been dominated by analysis of what has been deemed QE2. For those of you who are unfamiliar with the concept, QE2 is simply an acronym for Quantitative Easing 2. The first round of QE began in March of 2009 when the Federal Reserve embarked on a plan to buy $1.25 trillion in agency mortgage backed securities (those securitized by Fannie Mae and Freddie Mac) and $300 billion of longer term US treasuries. However, with unemployment still uncomfortably high and the perception that there is only a trivial risk of inflation on the horizon, the Fed is at it again; this time vowing to buy $600 billion of US Treasuries over the next eight months. Specifically, the Fed’s goal is to reduce interest rates available to individuals and businesses even further. Usually, when it wants to achieve that objective, the Fed uses its Fed Funds Rate (FFR) to manipulate interest rates. The FFR is a rate at which depository institutions (primarily banks) lend money to each other (at the Fed) on an overnight basis. During its periodic meetings, the Fed determines the target Fed Funds Rate based on its views regarding the economy. Then, if the Fed wants to slow down growth or contain inflation, the remedy is often to increase the FFR. By making it more expensive to borrow, banks will be less likely to borrow money that they can then lend to customers and excess credit creation will be forestalled. However, if the Fed wants to stimulate growth or prevent inflation from being too low, the protocol is to reduce the FFR. In other words, by making it less expensive to borrow, banks are incentivized to borrow and lend more freely, a dynamic that increases credit availability. However, the current problem is that the Fed can’t lower the FFR any further. Accordingly, as will be discussed more in depth later, the Fed has decided to purchase other assets in an attempt to prompt an incremental reduction in economy-wide interest rates. For people who are not professional investors or economists and are not following the markets day to day, the Fed’s recent maneuverings likely elicit a lot of questions. For instance, isn’t inflation generally a bad thing? If, so why is it that the Fed thinks inflation is too low and why in the world would it want to create inflation? Additionally, people may be wondering what exactly the Fed is trying to accomplish by buying more Treasuries. If interest rates are near historical lows, what is the benefit of slightly lower interest rates? Finally, another logical question has to do with what the Fed plans to do with all of the Treasuries and mortgage backed securities it has bought over the last year and a half. If it eventually tries to sell them in the open market, won’t that push up interest rates and impact the economic recovery? But, if the securities cannot be sold without affecting interest rates, couldn’t the increased money supply and credit availability lead to inflation when the economy starts picking up again? Clearly, there is a lot of uncertainty regarding the quantitative easing initiative and the goal of the article is to address some of those concerns. Specifically, by trying to answer the questions posed above, we hope to shed some much needed light on the inner workings and intentions of the Fed. Why is the Fed trying to create inflation? The Merriam-Webster online dictionary defines inflation as “a continuing rise in the general price level usually attributed to an increase in the volume of money and credit relative to available goods and services.”2 In more simplistic terms, as the money supply increases, prices of goods and services tend to rise as well. On the flip side, deflation is defined as “a contraction in the volume of available money or credit that results in a general decline in prices.”3 Deflation occurred in the US during the 1930’s and many historians and economists believe it was a contributor the length and severity of the Great Depression. The kind of deflation that the Fed worries about is not the falling prices of electronics due to technological innovation. Instead, the Fed is determined to prevent falling asset prices and declining wages that lead business to stop investing, consumers to stop spending and the economy to grind to a halt. Thus, there are a number of metrics that the Fed uses to monitor the level of inflation, especially the Consumer Price Index (CPI) and the Producer Price Index (PPI). Usually, in a stable and growing economy with a moderately increasing money supply, both these and other metrics reflect the fact that wages and the prices of goods increase a little bit each year. But, as a result of the financial crisis and the ongoing unemployment epidemic, Ben Bernanke and a number of his fellow Fed Governors believe that the inflation rate is too low and that destabilizing deflation is a real possibility. The Fed has a mandate to foster both maximum employment and price stability. But, when it comes to price stability, the truth of the matter is that Bernanke is much more concerned about deflation than inflation. Therefore, in order to prevent a severe bout of deflation, he is more than willing to take measures that stoke minimal inflation but keep inflation expectations from getting out of line with the current rate. In normal times, the Fed can achieve these goals by adjusting interest rates. However, the current Fed Funds Rate is so low (0%-.25%) that the Fed no longer has the ability to cut interest rates in order to stimulate the economy or cause inflation. Fast forwarding to the present, given the severity of the downturn we have already experienced, Bernanke and his cohorts are worried that deflation would damage investment and spending and thus push unemployment even higher and the US into a depression. Unfortunately, what this fear of deflation means is that the Fed is likely to err on the side of inflation, which history has shown can get out of control if the monetary authorities are not extremely careful. What is the Fed’s goal in reducing interest rates further? Not only is the Fed helping to inflate stock market prices and to push people into riskier assets, but the near zero Fed Funds Rate and the buying of other assets is forcing people to buy hard assets as an inflation hedge. So, while the Fed believes that inflation is too low, at some point the dramatic price increases in commodities are going to flow through to consumers. And, with stagnant wages, unemployment clearly not declining fast enough and fiscal stimulus winding down, the people who spend a disproportionate percentage of their income on daily necessities (food, clothing, household items) are going to really feel the pain when prices begin to rise. We also should point out that zero interest rate policy has been a godsend for the banks. First off, the banks can borrow at basically 0% from the Fed and immediately turn around and buy 10 year US Treasuries that yield north of 3%. In essence, the banks can choose to receive a risk free spread of 2.6% on their money as opposed to lending it to consumers and businesses to help jumpstart the economy. In addition, by holding interest rates down the Fed has induced large corporations to issue billions of dollars of long term debt at very attractive rates. Obviously, this is great for shareholders of these companies but it has also led to huge revenues for the banks who underwrite these debt offerings. In summary, it certainly appears that the Fed’s asset purchases have benefited those with large investments in stocks, large banks, and big corporations at the expense of the rest of America. How is the Fed going to sell all of the assets it has bought? This, ladies and gentlemen, is the million dollar question. To accurately assess the situation, it is necessary to analyze the Fed’s balance sheet. As of the most recent data available on the Fed’s website, the dollar amount of assets on the Fed’s balance sheet was just about $2.35 trillion7. To that number, you can at least add the $600 billion of Treasuries that will be purchased over the next eight months, bringing the total near $3 trillion. Compare that to the $914.8 billion in assets the Fed held at the end of 2007 and it is possible that the Fed will have more than tripled its balance sheet in three and a half years8. The liability side of the balance sheet consists mostly of balances that banks hold on reserve with the Fed. At the end of 2007 these deposits amounted to $20.77 billion and are now about $1.26 trillion. This is what John Hussman meant when he said that that there are over $1 trillion in idle reserves in the banking system. In other words, banks are hoarding money and leaving it with the Fed instead of lending it out. In any case, the Fed is going to have to sell assets unless it wants to see the money supply explode when the economy starts to improve on a sustainable basis and banks start lending out those reserves. As a hypothetical, let’s say the Fed wants to get its balance sheet back to where it was at the end of 2007. This would entail selling somewhere around between $1.5 and $2 trillion in assets, assuming the Fed follows through on its most recent promises and then refrains from more quantitative easing (the latter being a very dangerous assumption). Clearly, if the Fed tried to sell these assets all at once the market would not be able to absorb the sale and interest rates would likely go through the roof. So, unless inflation had accelerated to very uncomfortable levels, the Fed would probably try to wind down its balance sheet over a number of years in order to avoid killing a nascent economic recovery and to ensure a somewhat orderly rise in interest rates. Bernanke did actually hint at the unwinding issue in his speech from 2002. Specifically, he indicated that “[b]ecause some of these alternative policy tools are relatively less familiar, they may raise practical problems of implementation and of calibration of their likely economic effects.” So, it appears that Bernanke was aware of the potential pitfalls at the time of his unfortunately prescient speech. However, the magnitude of the necessary asset sales was likely not even a possible outcome in Bernanke’s mind but unquestionably needs to be addressed sooner rather than later. Let me try to explain why. As of December 1st, 2010 the Fed had a net worth (total assets minus total liabilities) of $56.02 billion. In addition, the majority of the Fed’s assets base consists of securities held outright, which total about $2.088 trillion. Now, let’s say the Fed wants to sell $1.5 trillion of those assets to reduce the size of its balance sheet. This is not the forum to dive into a deep discussion of bond math and the duration of the Fed’s security holdings. However, the important thing to understand is that if market forces cause interest rates to rise, the value of the previously purchased assets on the Fed’s balance sheet will fall. The Fed likes to claim that it has the ability to hold assets to maturity, a fact that implies that the Fed should not have to mark its balance sheet to current market prices. However, in the event that the Fed was forced to sell in order to combat potential inflation, it could realize losses on those sales. Specifically, with about $56 billion in equity, the Fed would only have to realize a 3.7% loss on the sale of the $1.5 trillion in securities to wipe out 100% of its equity. And you thought Bear Stearns and Lehman Brothers had a lot of leverage. Smart people can argue about whether or not the Fed can actually be insolvent, but the idea that America’s central bank could have assets worth less than its liabilities does not inspire a lot of confidence. There is no way to know how much interest rates will have risen when the Fed wants to unwind its balance sheet, but the truth remains that a 3.7% realized loss on asset sales is certainly not that farfetched. Thus, the Fed may be unable to sell securities when it wants to increase interest rates unless it wants to realize substantial losses. Then, the fact that the Fed’s balance sheet could be locked in at the current size is very troubling, especially given the implications for inflation. The purpose of this piece is to illuminate some of the risks of quantitative easing. Many talking heads have taken the stock market rise that came about after rumors of QE2 emerged to mean that most investors approve of what the Fed is doing. But recently, two luminaries of the investment world, Bill Gross of PIMCO and Jeremy Grantham of GMO, have published scathing critiques of the Fed’s policies (see link’s below). However, we should all be careful to not underestimate Ben Bernanke and the Fed. As a group, the members have a lot of influence and a number of tools at their disposal. As such, I am certainly not saying that quantitative easing will unequivocally not work or that the US is on a dangerous path that cannot be reversed. I am also not implying that the stock and bond markets are poised for large declines. Specifically, what I do believe is that the Fed’s attempts to inflate assets may not be sustainable unless the economic fundamentals improve as well. Accordingly, my humble advice is to watch the developing situation very closely, especially when it comes to commodity inflation and rising interest rates. America is in uncharted territory. It looks as though we will live through at least a tripling of the central bank’s balance sheet in just a few short years. Such a circumstance is unprecedented in modern US history. As such, whether or not QE2 is “working” may depend on who you are and what you are invested in. Therefore, it is the job of investment managers to understand the risks and position their clients in a way that protects them from both the intended and unintended consequences of QE.